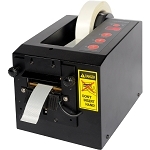 FS-205C 2mm 8" Hand Impulse Sealer with cutter, overstock sale, subject to stock on hand. Non-returnable. FS Impulse Hand Sealers w/ Sliding Cutter allows you to cut and seal in one easy step. 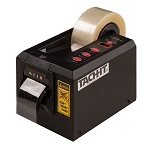 FS Hand Sealers seal poly bags and other thermoplastic materials quickly and efficiently without any warm-up time. Depending on the model of the machine, material up to 20" wide and 20mil total thickness can be sealed. The sealers are equipped with a plug-in electronic timer which controls the different sealing times needed for the varying thicknesses of different materials. Available in 8" and 12" with a 2mm, 3mm, or 5mm seal width. Seal and trim tubing in one step. Cutter is located 1/4" above the seal line. Easy to Operate: Set the timer; insert the bag between the sealing bars, then press down and release. We recommend that the user hold the sealing arm down for an additional second or two to ensure enough time for the bag to set and cool. To cut the bag, slide the cutting bracket across the bag. Subject to stock on hand. F-10-75-2000 10" 75 gauge PVC shrink film, 2000' roll, subject to stock on hand. Non-returnable. MST0010010 10" 100 gauge polyolefin shrink film, approximately 2600' roll, subject to stock on hand. Non-returnable. RK-12H-5 12" 5mm Repair kit (W/O Blade), fits KF-305HC sealers, subject to stock on hand. Non-returnable. RK-4H-5 4" 5mm Repair kit, fits TISH-105 sealer, subject to stock on hand. Non-returnable. Ships by USPS. RK-8H-5 8" 5mm Repair kit, fits TISH-205/205C sealers, subject to stock on hand. Non-returnable. RK-8H-R 8" Round Repair kit, fits KF-200H sealers, subject to stock on hand. Non-returnable.